Omizo castle (大溝城) is located in the south edge of Takashima plain at the northwest lakeshore of Lake Biwako. Unlike eastern shore, western shore of Lake Biwako is a mountainious area and flatlands is limited to only Sakamoto area at the near the south edge of the lake and this area. 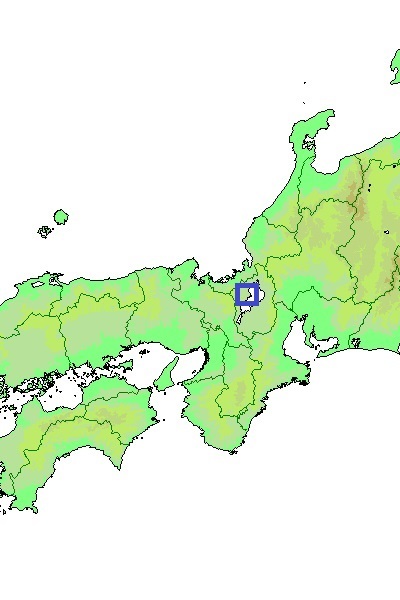 In addition to this, this area is connected to the ports along Sea of Japan such as Tsuruga port or Obama port (both Fukui prefecture), thus goods of northern countries were bought to this area from Tsuruga or Obama port, and loaded to the ship at Omizo port and shipped to Otsu port by ship. As above, Takashima plain was an important of communication. After the extinction of Azai clan, which originally held Takashima area since the middle of 16th century, by Nobunaga Oda (1534-1582) in 1573, Takashima area was given to Kazumasa Isono (?-?). Kazumasa was originally a commander of Sawayama castle (Shiga prefecture) under Azai clan and a brave general who served as a vanguard at the battle of Anegawa in 1570. After the battle he stand Sawayama castle from fierce attack of Oda army over one yaer, but being separated by Odani castle (Shiga prefecture), the main base of Azai clan and suspected of surrender to Oda clan, Kazumasa actually surrendered to Oda clan in 1571. Nobunaga evaluated Kazumasa’s talent and appointed hims as a commander of important area surrounding Lake Biwako along with important generals such as Mitsuhide Akechi or Hideyoshi Hashiba. But in 1578, Kazumasa suddenly left Oda clan. It was said that Nobunaga forced to hand over Takashima area to Nobusumi Tsuda (1555-1582), a nephew of Nobunaga, but the precise reason is unclear. Anyway Nobusumi became the next governor ot Takashima area. Nobusumi Tsuda was the eldest son of Nobukatasu Oda (1536-1557, famous as another name Nobuyuki), the younger brother of Nobunaga. Contrary to Nobunaga who made strange behavior with his faction in young age, Nobukatsu grew as a polite person and placed at Suemori castle (Aichi prefecture). Thus after the succession of Oda clan by Nobunaga in 1556, old vassals such as Hidesada Hayashi (?-1580) or Katsuie Shibata (1522-1583) once made a rebellion to Nobunaga to place Nobukatsu as a leader. But after the defeat at the battle of Inou in that year, these general changed to Nobunaga side and Nobukatsu became isolated. After the battle Nobunaga attacked Nobukasu at Suemori castle, but by a petition of their common mother Dota Gozen Nobunaga once forgave Nobukatsu. But next year Nobukatsu attempted revolt to Nobunaga in cooperation with other hostile relatives of Oda clan, and Katsuie who now supported Nobunaga reported this fact to Nobunaga. Nobunaga pretended to be ill called Nobukatsu under the pretext of an inquiry, then assassinated Nobukatsu at Kiyosu castle (Aichi prefecture) to extinguish future anxiety. When his father was assassinated by Nobunaga, Nobusumi was not killed by a request of Dota Gozen. Nobusumi changed his sir name to Tsuda, and grew up under Katsuie. After growing up, starting up from suppression of Ikko Ikki uprising in Echizen country (Fukui prefecture), Nobusumi participated in many battles and made achievement. Even though a son of betrayer, Nobusumi promoted to fifth position of Oda clan, which was after Nobunaga himself and three elder sons and higher than brothers and other sons of Nobunaga. Further he married with a daughter of Mitsuhide Akechi (1528-1582), one of the highest ranked general of Oda army and regional commander of Kinki region. In 1578, as a new ruler, Nobusumi started build new castle at Omizo. This castle was planned by Mitsuhide, and even though it was not a large castle but guarded by lake Biwako or Otomegafuchi pond, Omizo castle was a secure castle. On the basement protruded into the water there might be three or four level main tower, and surrounding central area there were secondary area and third area. The structure of the castle quite resemble to Sakamoto castle, which was also built by Mitsuhide Akechi. With the position of relative of the ruler, his talent and powerful brother in law, the future of Nobusumi looked bright. Nobusumi fought at various place as mobile force, and also focused on the development of Omizo town. But the fate of Nobusumi suddenly changed at the incident of Honnoji in 1582. As Mitsuhide Akechi, his father in law, made coup d'etat against Nobunaga and killed him, the situation of Nobusumi became worsened. At the time of incident Nobusumi stayed Osaka castle to support Nobutaka Oda (1558-1583), third son of Nobunaga nominated as the commander of expeditionary force to Shikoku island. But Nobutaka and Nagahide Niwa (1535-1585), vice commander of expeditionary force, became suspicious about Nobusumi and forced Nobusumi to suicide. Unlike his father, Nobusumi did not had a will to rebel against Nobunaga. Even though a husband of his daughter, Mitsuhide might not inform his attempt to Nobusumi as Nobusumi acted separately from Mitsuhide and it was necessary to keep secret only within close generals. But the situation of Nobusumi as son of former rebel might evoke the suspicion. Further, even if it was least possible, Nobutaka might attempt to exclude the rival of Nobunaga's successor fearing his talent. After the fall of Mitsuhide, next ruler Hideyoshi Toyotomi (1537-1598) placed Takatsugu Kyogoku (1563-1609) as a commander of Omizo castle. Takatsugu promoted to the commander of Omi Hachiman castle in 1590 and this castle became vacant, but after the battle of Sekigahara in 1600, Edo Shogunate appointed Wakebe clan as a governor of Takashima area in 1619. But due to Ikkoku Ichijyo Rei (one country one castle rule), Wakebe clan was not allowed to have castle thus broke the castle except for basement of main tower, and built his office at the site of former third area. Now most part of the lake and pond surrounded the castle was reclaimed and the scenery of former water castle was lost. But half broken basement of main tower consists of large stones still remain between local hospital and elderly nursing home, and still shows dignity of talented relative of Nobunaga until now. Around castle old town including outer gate diverted to the house still remains. 15 minutes walk from JR West Kosaisen line Takashima station. 40 minutes drive from Hokuriku Jidoshado Expressway Kinomoto interchange.